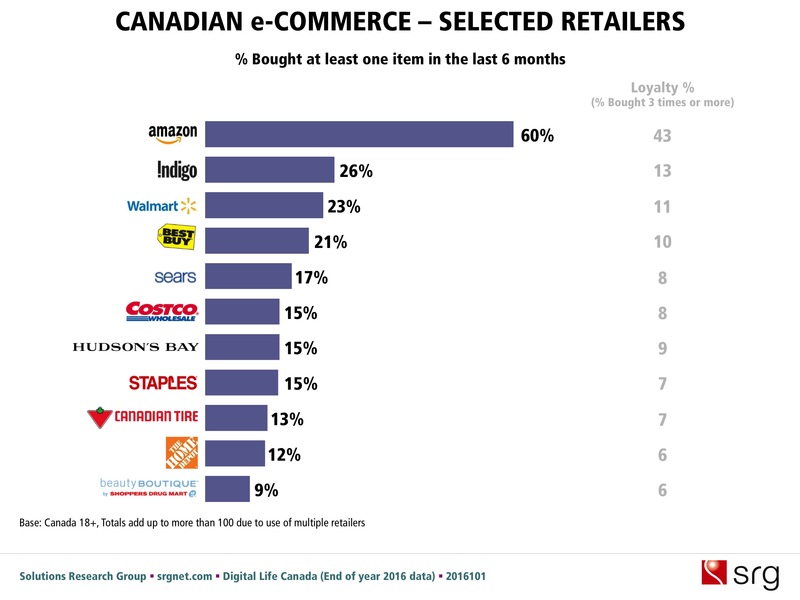 AMAZON DOMINATES CANADIAN E-COMMERCE: CAN ANYONE CATCH UP? When it comes to online retail in Canada, most of the dollars flow through the mighty Amazon. Sixty per cent have purchased something from Amazon in the past six months according to our research. That’s more than twice number who shopped at Chapters-Indigo (25%) or retail giant Walmart (24%). Amazon – which has a reported 133 million items, ranging from books to boxer briefs and boxing gloves, available on its Canadian site – is also adept at attracting repeat business, with 43% saying they have bought from the company three or more times in the past six months. That repeat rate is higher than the total of the next four retailers on the list. The world’s eighth largest retailer also boasts broad-based appeal, with 46% of Canadians 50 and over making a purchase on the site in the past six months as well as 69% of people in both the 18-29 and 30-49 age groups. Canadians are increasingly enthusiastic online shoppers, with more than one-third (39%) purchasing something online in the past week – up from 36% in 2015 and 33% in 2013. Books are the most commonly purchased item online among both the 30-49 and 50+ age groups, while clothing tops the list among Millennials 18-29. Younger Canadians are also much more likely to purchase items like jewelry and makeup online, another example of how Millennials are changing the face of retail shopping.